Joe Hart is one very lucky man. The English shot-stopper made an absolute hames of a free-kick today that actually worked out in Man City's favour. A basic free out was just too difficult of a task for Joe Hart to complete against QPR today. The City keeper completely mishit a restart and gifted it to Charlie Austin. The striker did fantastically to capitalise on his opponent's mistake and coolly slotted the ball into the net. 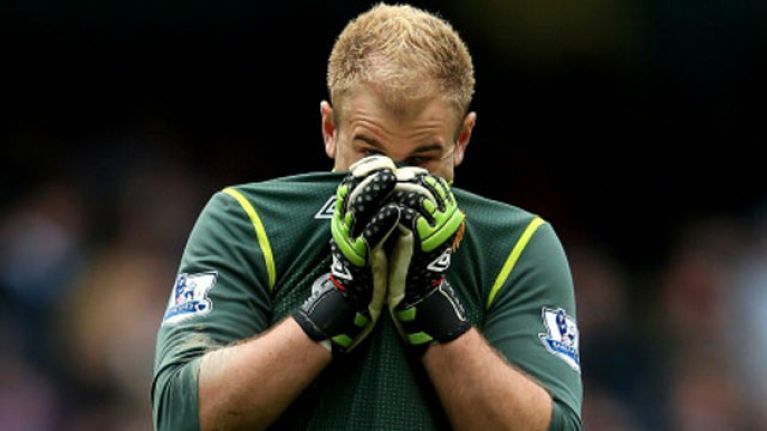 However, Hart's blushes were (somewhat) spared when the referee disallowed the goal. As the replay shows, Hart's inability to take a free-kick actually saved his team's bacon as rules state a dead ball from within a team's own penalty area must leave the 18-yard box or be retaken. Remarkably, the free-kick was the result of another Austin disallowed goal. He had put the ball into the net just 30 seconds before this incident but he was well-offside. The match finished up with both teams sharing the spoils 2-2.